Good. Personal inscription on first page, **SHIPPED FROM UK** We believe you will be completely satisfied with our quick and reliable service. All orders are dispatched as swiftly as possible! Buy with confidence! Harris, Jim. Very Good. A southwestern adaptation of "The Three Little Pigs". Sewn binding. Cloth over boards. With dust jacket. 32 p. Contains: Illustrations. Reading Rainbow Books. Intended for a juvenile audience. Harris, Jim. Good. A southwestern adaptation of "The Three Little Pigs". Sewn binding. Cloth over boards. With dust jacket. 32 p. Contains: Illustrations. Reading Rainbow Books. Intended for a juvenile audience. Good. 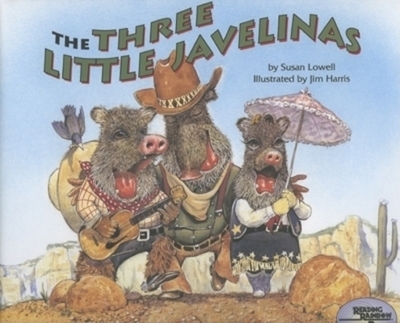 The Three Little Javelinas Edition: Reprint by Susan Lowell. Glued binding. Intended for a juvenile audience. Good. [ No Hassle 30 Day Returns ] [ Edition: reprint ] Publisher: Cooper Square Publishing Llc Pub Date: 9/1/1998 Binding: Hardcover Pages: 32.